Mahamadou Issoufou is a Nigerien politician who is President of the Nigerien Party for Democracy and Socialism a social democratic party. Prime Minister of Niger from 1993 to 1994 and President of the National Assembly from 1995 to 1996, and he has stood as a candidate in each presidential election since 1993. During the Presidency of Mamadou Tandja (19992010), Issoufou was the main opposition leader. Issoufou, an ethnic Hausa, was born in the town of Dandaji in Tahoua Department. An engineer by trade, he served as National Director of Mines from 1980 to 1985 before becoming Secretary-General of the Mining Company of Niger (SOMAIR). In February 1993, the country's first multiparty legislative and presidential elections were held. In the parliamentary election, Issoufou's party, the PNDS, won 13 seats in the National Assembly and Issoufou himself won a seat as a PNDS candidate in Tahoua constituency. Together with other opposition parties, the PNDS then joined a coalition, the Alliance of the Forces of Change (AFC). This coalition held the majority of the newly elected seats in the National Assembly. Later in February 1993, Issoufou ran as the PNDS candidate in the presidential election. He placed third, winning 15.92% of the vote. The AFC then supported second-place finisher Mahamane Ousmane for president in the second round of the election, held on March 27. Ousmane won the election, defeating Tandja Mamadou, the candidate of the National Movement of the Development Society (MNSD); with the AFC holding a parliamentary majority, Issoufou became Prime Minister on 17 April 1993. On 28 September 1994, Issoufou resigned in response to a decree from Ousmane a week earlier that weakened the powers of the prime minister, and the PNDS withdrew from the governing coalition. This caused the coalition to lose its parliamentary majority, and eventually led to a new parliamentary election in January 1995. Issoufou and the PNDS forged an alliance with their old opponents, the MNSD, and in the January 1995 election the alliance won a slight majority of seats; Issoufou was then elected as President of the National Assembly. The new situation of cohabitation resulted in political deadlock, and, with the dispute between the president and the government deepening, on 26 January 1996 Issoufou requested that the Supreme Court remove Ousmane from office for alleged incapacity to govern. A day later, on 27 January 1996, Ibrahim Baré Maïnassara seized power in a military coup. Issoufou, along with President Ousmane and Prime Minister Hama Amadou, was arrested and subsequently placed under house arrest until April. They were all put on television by the military regime in February to express the view that the coup was caused by problems in the political system and to support changes in the system. He placed fourth (receiving only 7.60% of the vote) in the flawed 78 July 1996 presidential election that gave Maïnassara an outright victory. Along with the three other opposition candidates, Issoufou was placed under house arrest on the second day of polling and held for two weeks. Afterward, he refused to meet with Maïnassara, unsuccessfully appealed to the Supreme Court for the election to be annulled, and the PNDS called for demonstrations. On July 26, he was again placed under house arrest, along with another leading PNDS member, Mohamed Bazoum; they were freed on the order of a judge on 12 August. Following a pro-democracy demonstration on 11 January 1997, Issoufou was arrested along with Ousmane and Tandja and held until 23 January. Maïnassara was killed in another military coup in April 1999, and new elections were held in late in the year. In the first round of the presidential election, held in October, Issoufou placed second, winning 22.79% of the vote. He was later defeated by Tandja Mamadou in the November run-off, capturing 40.11% of the vote compared to Tandja's 59.89%. He was backed in the second round by the unsuccessful first round candidates Hamid Algabid, Moumouni Adamou Djermakoye, and Ali Djibo, while Tandja received Ousmane's support. After the announcement of the provisional results showing Tandja's victory, Issoufou accepted them and congratulated Tandja. In the November 1999 parliamentary election, Issoufou was again elected to the National Assembly as a PNDS candidate in Tahoua constituency. In a repeat of the 1999 election, Issoufou placed second behind incumbent Tandja in the 2004 presidential election, winning 24.60% of the vote. He was defeated in the run-off, winning 34.47% of the vote to Tandja's 65.53%; however, this was still considered an impressive result for Issoufou, since the other candidates had backed Tandja in the second round. Issoufou, who targeted corruption in his campaign, accused Tandja of using state funds for his own campaign, along with other accusations of electoral misconduct, and said that the election was not as transparent as the 1999 election. In the December 2004 parliamentary election, Issoufou was re-elected to the National Assembly as a PNDS candidate in Tahoua constituency. In 2009, the PNDS strongly opposed Tandja's efforts to hold a referendum on the creation of a new constitution that would allow him to run for re-election indefinitely. At an opposition rally in Niamey on 9 May 2009, Issoufou accused Tandja of seeking "a new constitution to stay in power for ever" and the establishment of "a dictatorship and a monarchy". As leader of the Front for the Defence of Democracy (FDD) opposition coalition, he said on 4 June 2009 that a planned anti-referendum protest would be held on 7 June despite an official ban. As part of the constitutional dispute, Tandja assumed emergency powers on 27 June. Accusing Tandja of undertaking a coup d'état, "violating the constitution and ... forfeit[ing] all political and moral legitimacy", Issoufou called on the armed forces to ignore his orders and urged the international community to intervene. Issoufou was detained at his home by the army's paramilitary police on 30 June; he was questioned and released after about an hour. A nationwide strike called by the FDD was held on 1 July and was deemed partially successful by the press. The referendum was held on 4 August 2009, despite the opposition's furious objections and calls for a boycott, and it was successful. Speaking on 8 August, shortly after the announcement of results, Issoufou vowed that the opposition would "resist and fight against this coup d'etat enacted by President Tandja and against his aim of installing a dictatorship in our country". 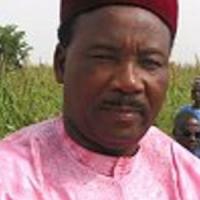 On 14 September 2009, Issoufou was charged with misappropriation of funds and then released on bail. He said that he was actually charged for political reasons. Subsequently he left the country. On 29 October 2009, international warrants for the arrest of Issoufou and Hama Amadou were issued by the Nigerien government, and Issoufou returned to Niamey from Nigeria late on 30 October in order "to cooperate with the judiciary". Tandja was ousted in a February 2010 military coup, and a new transitional junta enabled the opposition leaders to return to politics in Niger while preparing for elections in 2011. The PNDS designated Issoufou as the party's candidate for the January 2011 presidential election at a meeting in early November 2010. Issoufou said on the occasion that "the moment has come, the conditions are right", and he called on party members to "turn these conditions into votes at the ballot box". Some observers considered Issoufou to be potentially the strongest candidate in the election.